Remember white bread? Go back in time with this easy recipe. I heat my milk & oil combo in the microwave for about a minute but you can do it on the stove. If you replace the oil with butter, add it to the milk before warming. The butter doesn’t have to be completely melted but should be very soft. Be sure to aerate your flour before measuring! Combine flour, yeast, sugar & salt in a large mixing bowl. Warm the milk and oil together to 120-130° F.
Add milk/oil to flour mixture and beat with electric mixer on high for 2 minutes. On low speed slowly add enough flour (about 1/2 cup) until dough forms a soft mass. Shape dough into a loaf and place in a greased 8 1/2 x 4 1/2 -inch loaf pan. Cover with a towel and let rise in a warm spot for about an hour, until it’s one inch taller than the pan. Preheat oven to 375° F & bake for about 25 minutes. After the first 15 minutes, I cover the top of the loaf with a foil tent to prevent over-browning. Bread is done when the internal temperature is 190° F.
No mixer? No instant yeast? No mixer? Just mix it in a bowl by hand but knead longer, about 150 turns. No instant yeast? Use regular dry active yeast but check the package for liquid temperature, which should be lower – probably 110-120° F.
113 Comments on "Easy White Bread (no egg)"
Never made bread, but always wanted to learn. When I made your bread the first time I was amazed and delighted how good and easy it was. You can teach an old dog how to cook. Loved your show, wish you were on again. Thanks for making me feel like an old pro. I just made this bread and did not knead it by hand I just used the cuisinart food processor and it turned out amazing! Yum! I also used almond milk. The kneading and mixing instructions are a little confusing. In the directions it says turn out and knead 50 turns. At the very bottom it says 150 turns. Please explain a little more. It’s 150 turns if you don’t use a mixer. What if you don’t have a thermometer for the milk? How hot is 120? Any tips? I made some bread last night from my Mother’s old cookbook and added some ground flax. The house reeked! I’m trying Jenny’s recipe tomorrow. My egg was cold. I put it in my pocket (watch the video!) to warm up. I followed the instructions to the letter and and now at the second (35-60 minute) proof. Walked out of the kitchen to another room, sat down and felt something in my pocket… a room temperature egg! HA! I guess this will be an ‘eggless’ bread, after all! Too funny! I just baked this bread, but I used almond milk instead. It smells amazing we have not tried it yet. I also baked it in a deep dish pie pan. This bread will be for dipping a cream cheese artichoke dip. 1st. I love your personality, Feels as though we met before.Do you ever get that feeling with people? Anyway .My Question is, I’m backing your rised white Bread. It ask for reg. flour I have rised flour and active yeast and the rest of the ingredients called for.what do I need to do ,or I’m I good. Thanks for the recipe, turned out delicious! I don’t have a stand mixer, just a handheld one. Will that work for the mixing of the dough? Many years ago I realized, that life in the kitchen would be so much sweeter with a mixer and after checking all the options, I bought a heavy duty KitchenAid and some attachments, which increased over time. After more than 20 years of service, it is still going strong without any repairs. It may cost a bit more to start, but I did not want anything cheap, just inexpensive. And KitchenAid filled the bill. I absolutely love this bread and many of the other recipes of yours that I’ve tried. They are all so delicious and SUPER EASY! My latest was the Christmas Wreath (I opted for the braided loaf version]. My second one in a week was better than the first. I’m thankful for stumbling upon your website last year….and I love your videos, especially the humour. Happy New Year! 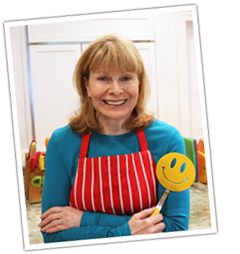 Jenny – what I like about all of your recipes (that I have made thus far) is they are easy to make and delicious. I made this bread and it was wonderful. One of the best breads I have ever eaten. The texture was one thing I really enjoyed. Can’t wait to try another one of your recipes. Thank you. Will a stand mixer with dough hook do the job of kneading. Arthritis in my hands makes hand kneading a challenge. I use a B & D bread machine to do my initial mixing and kneading. Once that is done (takes an hour and a half for initial mixing, kneading and first rise) I then take it out onto a floured board and do the hand folding over amd then place it into the bread pan for the secong rise (approx 1/2 hour) then into the oven for the 1/2 hour baking. Turns out great every time. Hope this helps you. I remember you from back when?? I am going to bake your bread tomorrow. I follow and love your video’s Hummmm!! your Smart! Sweet!! and Funny too!! Keep up the great work. Ohhh!! and so cute too! I Like your outfits……….. Thanks so much for placing this bread receipt online, I use to bake homemade yeast bread years ago and lost my receipt.I just so happen had a couple packets of Fleishmans Yeast so I will be baking tomorrow. I also notice someone comment above about the Fleishmans Yeast packet contains 2 1/4 teaspoons, Im glad I read the comment section and your answer. ( LOL) your crust isn’t perfect but repairable ( I like that) So glad Jenny I ran across your site and I have bookmarked it to return again and again. My question is as long as the packet of yeast has not been opened is the shelf life indefinitely? Yeast has a short shelf life so check the expiration date. Once opened, it does not keep well unless frozen. Can you really freeze yeast with out messing it up? Also, do you know if this recipe will work in a bread machine? Has anyone tried it? My oven is very inconsistent and unreliable so I thought my old bread machine might be better. Someone else had asked about using a bread machine a while back but I didn’t see an answer anywhere. I love your website. I’m so glad I ran across it. I used to watch your show and I love how down to Earth you are. Thanks for sharing your recipes. I’ve done it in the bread machine but I prefer baking it in the oven. I do use the bread machine for mixing, kneading and first rise though. Freezing the yeast is a way to keep it fresh until you use it. Just keep it dry in a jar with a screw type lid. I freeze my yeast as soon as it comes in the mail (I buy it by the pound because it’s so handy and so much cheaper that way). Not only does it keep the yeast fresh up to the expiration date, but I have even used that same yeast a full year AFTER the expiration with fabulous results. However, when I take the yeast out of the freezer to use, I put the yeast right back in the freezer and don’t let it dawdle on the counter. That way it stays cold. Happy baking! I think the yeast would not be effective past the expiration date. I make a double batch frequently. My only problem is I always get one large and one slightly smaller loaf no matter how carefully I divide the dough, so I just live with it. use a food scale, so they will both bake in the same amount of time. Also make sure you use the same kind of pans. Glass and metal pans cook best as different temperatures and vary in cooking time. I tried both your with egg and eggless white breads, using no sugar. They turned out fine, and I prefer the taste that way. I think it is a matter of personal preference. Exception: when using milk that has slightly soured, I add the sugar. It tasted just like the sour milk without it, not at all like sourdough bread as I had hoped. Hi Jenny, could I use coconut milk? I have allergy to dairy. I only make it one way. Please look through the comments as someone may have addressed this. The no egg white bread sounds great. I like the old fashion taste.To break the rule about white Bread (is wunderbar) Does the recipe work using a bread machine? It can bake while a quick trip to the store is a must. THANK you for that fine and nice recipe. This is the best bread ever! I was afraid it would not come out ad nice as your…But this one is fantastic and delicious and wonderful ..Just like bread needs to be …I am so happy. Although it did not raise as much as on your picture i am so happy and will do it again. Your bread recipes that use one packet of yeast describe the amount as two teaspoons, 7 grams. Your whole wheat video shows Fleishmans yeast, and you say two teaspoons. I recently noticed that my packages of Fleischmans say 2 and 1/4 teaspoons, 7 grams. So does the Fleishmans website. Since you are in LA, and I am in Riverside County, it seems unlikely we are getting two different product lines from the same company, with the same name. This is a little confusing, to say the least. Perhaps Fleishmans made changes to the product labeling since you made your video and posted your recipes. I found your sight and first tried baking with yeast very recently. Possibly this could be why some people have trouble with your recipes. Is it possible that some people are measuring 2 teaspoons of yeast out of the package when they should not be reducing the quantity? Or…. They are using inexpensive measuring spoons that are not accurate if using a jar of yeast, or don’t know the measuring spoon should be mounded, then leveled with a knife, just like when measuring flour. Or… They are not using Fleishmans. Fleishmans is a Canadian product. Any other brand I have found in any store is from China. I trust the Canadians to do things right a whole lot more than I trust anything from China, based on experience. I hope this is helpful to you and to those who are having problems with your recipes not turning out as they should. I just learned today that chlorine and fluoride in tap water can kill yeast, which probably explains recent problems I have had with extremely slow rising of the dough. I find that either 2 or 2 1/4 teaspoons of yeast in a loaf of bread makes no difference in the result. THANK YOU JENNY. I have never baked bread or anything with yeast before, but I had grown unhappy at the poor selection of bread available at my local stores, so I decided to try your recipe. I have tried your white bread with egg 3 times with 3 different brands of flour. (I stock up and buy whatever brand is on sale when I see a good bargain in flour). Huge difference in amount of additional flour needed on one, lots of extra liquid needed on another. They were all “all purpose”, but I noticed dramatic differences in the texture between the small, regional brand, the national name brand, and the store generic brand from a wholesale/retail supplier. The national brand name product was almost as fine and powdery as corn starch, and also contained malted barley. I also wonder where the wheat was grown, since what variety will grow in the northernmost farm areas of Canada probably won’t do well in the southernmost parts of the USA farming areas and vice versa. I will soon be trying brand number 4, and this time I read the label carefully, which says “no sifting necessary”, which probably means it is pre-sifted. It made great tasting sugar cookies with my tried and true recipe, so I hope the bread will be acceptable. Don’t know what was on the labels of the previous brands because I dump the whole new bag in my large flour bin when it is empty, but these differences could be why some people have problems with the quantity of flour needed. I also noticed strong differences in the smell of the flour and the taste of each loaf. Next purchase will be back at the wholesale store. The bread it made needed the most extra flour but tasted the best, and…. Lucky Me… Their house brand flour is an arm and a leg cheaper than any brand anywhere else I shop, so using more flour won’t cost me more. I also am careful to use only large eggs from one store only because of quality, and their large size eggs ought to be labeled Extra Jumbo size, thus giving more liquid possibly than the egg you used when developing your recipe. Adding more flour or liquid as needed is necessary to get the “right feel” to the dough, as is the right amount of kneading. Practice makes perfect, as I am learning. Your video was extremely helpful, as I had absolutely no idea how to knead dough before I saw it. I am thrilled to see your practical recipes, not silly gourmet dishes that require 15 exotic, expensive, ingredients, some of which I have never heard of before, much less seen in any store in my area or anywhere I have lived before. I love your lighthearted, humorous approach to cooking, which makes your videos fun even if that particular recipe doesn’t appeal to me. I made this for my kids (& I) and it is delicious!!! I used the dough hook at med/ high speed on the KAid mixer and “kneaded” it till there was no more dough on the sides or bottom of the mixing bowl. My boys are PICKY. Thank you for this quick & easy recipe. I see you use a lot of sugar in your breads, can the amount be reduced? All of my bread recipes work really well as written but you can certainly try using less sugar, or if you’re not comfortable experimenting, you could look for a different recipe that’s already proven with less or no sugar. Can I try this with less amount of yeast ie, 1 tsp. I hate the smell of yeast. You could try but it probably won’t rise like it should. I read recently that weighing the flour is more accurate than using measuring cups – what are your thoughts?? I am making your recipe a little later today!! Weighing flour is more accurate but it seems like extra work so I still do it the old way. Hi Jenny, do you have a video of your no egg white bread? I have a large family of six adults and have been using this recipe for over a year now. I have at all times tripled the recipe and have never had any problems. Just remember to double or triple every item on the recipe list and you should be fine. My dough is proving as I type! I also may try this with water just to see what happens, milk might also contribute to short shelf life? Any ideas what would happen? I frequently make bread with water and no egg. So far I like this – it smells like Wonder Bread! Iodine is now in salt…they used it as a supplement in bread but started putting it in salt rather than bread to help prevent iodine deficiency and thyroid problems. We love these bread recipes too. But something my mother used to do, when she took her breads/rolls out of the oven was to lightly grease wax paper and go over the top of the bread. That will soften it. Wondering if that might help. If you seal fresh bread in a ziplock or bread wrapper, the natural moisture in the loaf will distribute and soften the crust also. I tried this recipe today with an electric mixer.. but when I’m going to knead the dough, it was so sticky and I have trouble to knead that so I added more flour (more than the additional flour in the ingredients). Should I mix it up much longer in the mixer or the temperature of milk isn’t appropriate? (I don’t have thermometer so I only heated it for 30 seconds in microwave). Even if the milk was the wrong temperature, it would not make the dough sticky. The only thing that would cause that is too much liquid or not enough flour. It’s possible you measured too much milk or not enough flour. If you sifted the flour before measuring, that could also cause the dough to be sticky. Try again, follow the recipe exactly with no changes, and aerate the flour before measuring. If it’s still a problem, you will need to send me an exact list of your ingredients for me to help further. Good luck! I have tried this recipe again yesterday and have the same problem :”(. Nevertheless, I baked it with the dough that somewhat sticky, it turns out well, the dough rise and tastes great, but I’m still not sure about that ‘sticky’ dough. I convert it based on your Metric Conversion Chart. Is it already correct? Your measurements are exactly right. I simply have no idea what else to suggest except to start with a little more flour. It’s better to start with more than to add more flour while kneading. Try starting with 2 1/4 cups of flour and please let me know if things get better. You might also want to try the new other white bread I just posted that has an egg. Love your channel. I think its the humidity or temperature. We are in Florida & most of the time if we are following a recipe we almost always use less liquid because of the humidity. Sorry Jenny, I am having the same trouble. I measured everything right but it is way too sticky. So I just kept adding more flour till it was not sticky anymore. Lot’s of floured to be added. More than what was called for. It is rising right now, so we shall see how it taste, I’ve always doubled my bread twice to rise and I noticed you don’t. Is that just old fashioned way of doing things? In comparing this recipe with the whole wheat one, how come the whole wheat one requires an addition 1/2 cup flour and this one does not? Thank you! I tried the whole wheat one and it is very good! Wanting to try white bread now. They both require the additional 1/2 cup of flour. You may have missed that. By the way, the whole wheat bread, which uses an egg in the recipe, also works with all white flour. Hi Jenny ! I love your recipes. Can we be friends? I’m always available here with any questions. Hi Jenny: I just made your recipe. It turned out really nice. Do you recommend sifting the flour before using it? Thanks. Another question, what is the actual height of the bread after being baked? Mine bakes up to about 1 1/2 inches above the rim of the pan. Just made this bread this week and it turned out pretty good. The shape was a little off, dipped in the middle, but otherwise not too shabby. And it taste wonderful. Thanks for sharing your baking recipes with the rest of the world; esp. me. Appreciate ya! I just made this bread today and it always turns out so make sure you follow the recipe EXACTLY and measure carefully. You also may have let it rise too much so don’t let it rise much higher than one inch above the rim of the pan. Make sure you preheat your oven long enough (mine takes 20 minutes) and don’t open the door for the first 15 minutes. Let me know how the next one turns out. OK, thanks for the advice; will attempt a 2nd bread soon and follow exactly. Hi Jenny I make this bread today love it thanks very much. I love this bread it didn’t rise as fast as yours but I just let it rise a little longer and it was great. I keep my house cooler than most people. Thanks you, I love watching you plus you make such awesome food. I got a big bubble on one side of my bread . I used dry active yeast instead of instant yeast. Could that be the reason or something else. 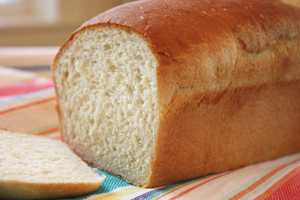 I have tried your whole wheat bread and it comes out really good every time !! I used 8 1/2 ” x 4 1/2 ” loaf pan . Okay , I will let you know next time I make it. Thanks so much !! Thanks. That note was from me and not “Kim.” I hope it turns out next time. I used 8 1/2 ” x 4 1/2″ loaf pan . Hi, Jenny. There is no egg in this recipe, am I right?. Made 2small loaves for gifts. Came out soft and excellent! My niece prefers white bread. Making bread is time consuming so I would rather go for healthy whole grains or brown bread. Since I came across your recipe for easy white bread which needs only one rise, I thought I’d give it a try. And the result? Same as a loaf which needs two rise. Now my niece will have her white bread more often. Thank you for the recipe. I did the whole wheat bread this morning, and it came out great. I am going to do the white bread. I am starting my baking classes at our food bank, and this should be so easy for the lades and gentlemen who attend. I really love this and I am not going to be buying bread any more. Thank you so much. This is a blessing. I am so glad that I found your website. Thank you again, and may God bless you for the help. Has anyone tried German black rye bread? It is so delicious. I love making bread, I have made a Swedish limpa bread and my company asked if she could take the extra bread home with her so she could eat it for breakfast. I said sure, I was so happy she liked it that much. Vou fazer este pão….depois posto a foto,ok! I do not know what type of yeast I have is it ok to use active dry yeast too? Please see the bottom notes on the recipe. I started out making white bread with your whole wheat recipe and then bought the KA white whole wheat flour and have made your whole wheat bread many times and do love it but my husband prefers white bread so am anxious to try this recipe and see how it turns out. to rise above one inch my cake tin.Kindly give me some tips where i went wrong.Is it over proofing or i should use flour. It’s hard to say without more information. First, is your flour a white flour? If not, that could be the problem. If it’s taking 2 1/2 hours to rise then either the yeast is stale or the milk it not hot enough. My guess is that the yeast is not fresh. Once you open a package of yeast it does not last long and should be kept air tight in the freezer. Also let me know if you followed the recipe EXACTLY, what method you used, and what size is your loaf pan? Thanks. I would enjoy watching a video for this recipe ! Hi jenny I am Devi from India I have tried this recepie and it has com out very well I hav also tried ur cinnamon buns and whole wheat bread thank u so much for the lovely recepies. Would love to see you offer up a low carb bread that was decent. I try your recipes out. So far the best one I have done is the easy, lower fat cinnamon buns. 🙂 they are delicious. I know asking for a good, fluffy low carb bread is kind of impossible, but I’d be willing to try again. Thanks for the recipes and videos. This does really look good and I must, once in a while, have my white bread fix! Tomorrow my house will once again smell heavenly from freshly baked bread. Ooooh that looks good!!! I will make this weekend!! Try Prairie Gold white wheat flour! Not organic but GMO free etc. Always great in all recipes with perfect results. Noone is the wiser.